Read more from the interview with CIO Applications. 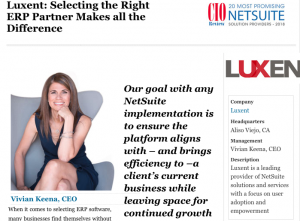 When it comes to supporting CIOs in their NetSuite implementations, Luxent’s learned a few things about the value of being a knowledgeable partner that is invested in its customers’ success: “We have a creative, responsive, people-first team that is always thinking about the customer and their success,” said Vivian Keena, Luxent CEO, in a recent interview with CIO Applications. The fact of the matter is that CIOs are asked to do a lot for their companies. 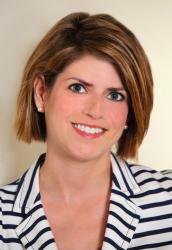 There’s the need to integrate, maintain, and find use for old, outdated platforms; the need to ensure data integrity and security across multiple teams, platforms, and devices; the need to train users on systems, policies, and protocols; the need to evaluate new technology solutions, including how they will or won’t work with existing infrastructure — and the list goes on. With a laundry list of needs, CIOs, especially those implementing new technology, are wise to work with consulting teams that can act as extensions of themselves. This means working with a CIO’s team to understand needs, goals, and obstacles in order to create a Business Process Review & Actions document that provides a roadmap that aligns with their overall plan for the year. Beyond “just” an implementation, however, is the “What next?” question that inevitably follows from executive teams, employees, and partners. 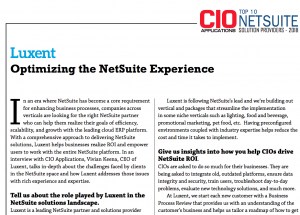 One way CIOs can take a NetSuite implementation to the next level is by adding purpose-built solutions that solve everyday challenges. For many ERP users, one such challenge is quoting. As Vivian notes in the interview: “For many manufacturers, [quoting is] not just the most important part [of the sales process], it’s also the most painful part. Quoting tends to be slow, complex, and prone to mistakes. 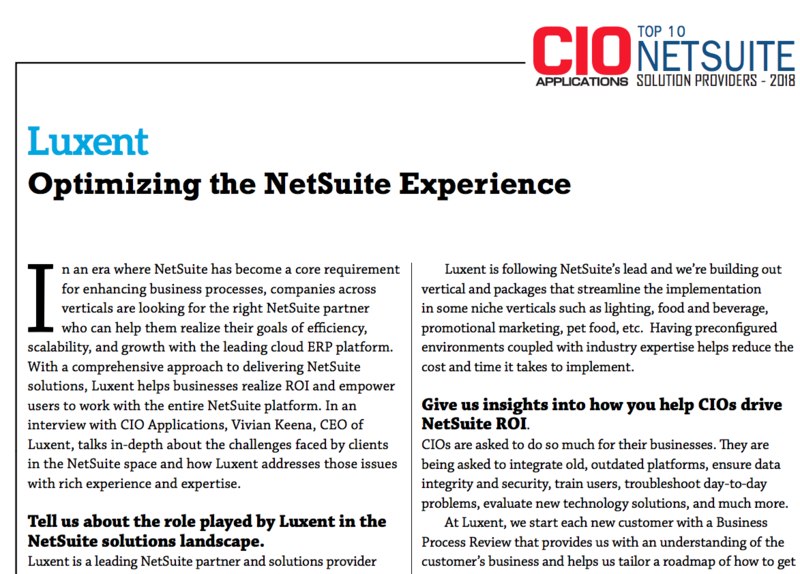 Luxent set out to change all of that by building iQ Configure, Price, Quote, a quoting tool that helps companies deliver quotes faster, more accurately, and all through an easy to use, smart, fast interface.” Automating the quoting process is an essential way CIOs can support their own NetSuite implementation and infrastructure going forward. Read more insights from Vivian in the article and reach out anytime with questions about how we can help your team with its NetSuite projects.